The ‘Settings’ sequence presents a chain of backdrops against which personal events and dramas were played out. Within the dynamic period preceding Seeing Things when Heaney deliberately swooped on anything that stimulated memory or association (DOD 320), he allowed himself to be transported back by the poems that ‘came on’ to the sites, subjects and emotions of primary experience, whence he weighs up what ‘in time … was extra, unforeseen and free’ (Markings I). All about ‘the myths surrounding eels’ (DOD93)! The poem sets an old wives’ tale alongside the non-scientific theory of an early classical scholar later discarded as poppycock. Heaney is taken by the eel’s alleged curative power useful to him at moments when his creative ‘blood sugar’ is low. The poet sets out to explore two teasers: why the creature is associated with magical restorative properties (the virtues of an eelskin); the creature’s provenance. Heaney draws first from Aristotle’s totally unfeasible creation myth: a rib of water drawn Out of the water that resembles a cursive handwritten letter: ell yielded up – a creature born of, from and in unlit watery currents (glooms and whorls and slatings of its surroundings). The old wives’ tale had it that once caught and skinned the eelskin became something ‘extra, unforeseen’ (Rediscoverd): a magical bandage (wrist … bound with eelskin) cascading strength (energy redounded) into joints especially vital to scribe or poet (a waterwheel/Turned in the shoulder), restoring aching limbs with miraculous speed (mill-races poured … made your elbow giddy). The renewed energy his fingers feel (unconstrained and spirited) imagines a watery hieroglyph (heads and tails that wriggled in the mud). 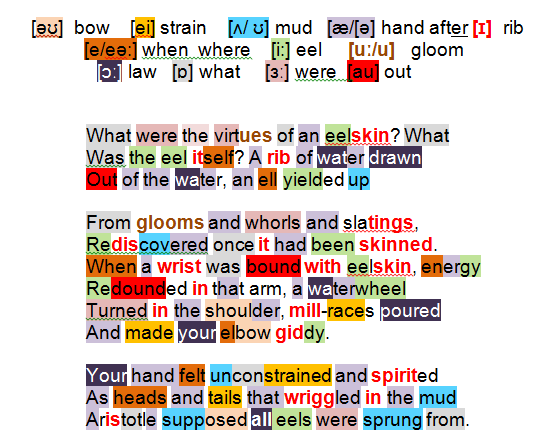 Though Aristotle’s zoological theories as regards the mud he supposed all eels were sprung from proved spurious Heaney has spotted a neat correspondence with his own world. As regards aching fingers Heaney noted St Columba’s plaintive ‘My hand is cramped from penwork’ in Columcille Cecinit of Human Chain.